It’s important to fill potholes as soon as they begin to form. 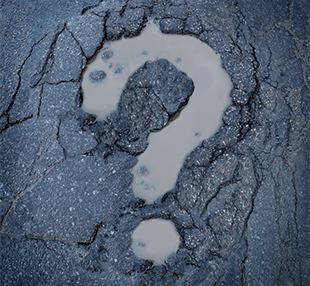 Left untreated, potholes can lead to larger areas of pavement failure as well as posing a threat of damage to vehicles and potential costly liability to property owners. 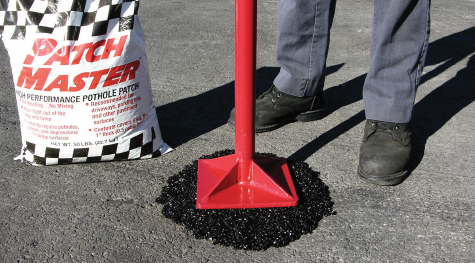 Cold-patch such as PatchMaster is typically the most common material used for filling potholes. Cold-patch is easy to use, economical and provides durable, lasting repairs. Step 3 – Compact material with hand tamper, car tires or another suitable compaction method that provides an even, level compacted surface. 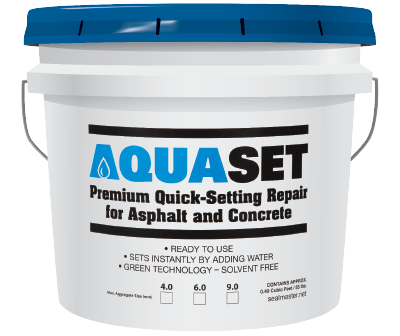 AQUASET is a new water-activated pothole cold-patch technology that features rapid set permanent pothole repair. This new technology is rapidly gaining in popularity among road maintenance crews as well as property owners due to highly successful results with the material. Potholes can also be filled using hot mix materials. The same procedures would be followed as outlined above. Step 3 – Prior to compacting material, spread a liberal amount of water over patch material. Allow to penetrate and soak into material. Water will activate the rapid curing mechanism within the patch material. Step 4 – Compact material with hand tamper, car tires or another suitable compaction method that provides an even, level compacted surface.